Carpal tunnel syndrome (CTS) is among the most common musculoskeletal disorder of occupational disorders. The treatment is often surgical and comes at a high cost to society. Beginning in 2003, P. Wagner developed a dynamic test, which permits the study of the kinetics of the median nerve (MN) at the wrist. He describes four stages (0, 1, 2, 3), with stage 3 corresponding to the loss of mobility of the Median Nerve (correlated to the results of the electromyography in his study). The goal of manual adhesiolyis is to bring about the return of normal kinetics during dynamic ultrasound, corresponding to complete remission of the symptoms for at least six months. We shall summarize his work, which offers a success rate of almost 90%, if the dynamic ultrasound results can be achieved. As the most common peripheral compressive neuropathy, CTS is increased by activities (typing, using a keyboard, playing a musical instrument, using a hammer, sewing, knitting…) or pathologies (diabetes, amyloidosis, thyroid insufficiency, cervico-thoracic outlet syndrome, trauma and tendonitis of the wrist). Diagnosis is based on pain during excessive activity of the hand or wrist, with nocturnal pain and a loss of strength. There are signs of Tinel and Phalen. Atrophy of the thenar muscles is late. After the failure of conventional medical treatment (cortisone injections, night braces, osteopathy…), surgery is beneficial, at the cost of a slight loss in strength. The carpal groove is divided into two parts by a septum, which is detached from the retinaculum to attach to the scaphoid and the trapezoid. The medial canal contains the Median Nerve and the tendons (t.) of the finger flexors and is bounded in front by the retinaculum, which is inserted in the tubercle of the scaphoid and trapezium at the outside, and the pisiform and hamate within. It is duplicated, from the view of the second radius, to encompass the carpal radial flexor tendon. There are adherences between the retinaculum and the palmar fascia (palmar carpal ligament), upon which the Palmaris longus is inserted. The Median Nerve, with wrist extension, is located just below the retinaculum, in front of the tendons of the flexor digitorum superficialis of the fingers (FDSF) and within the flexor of 1st itself. 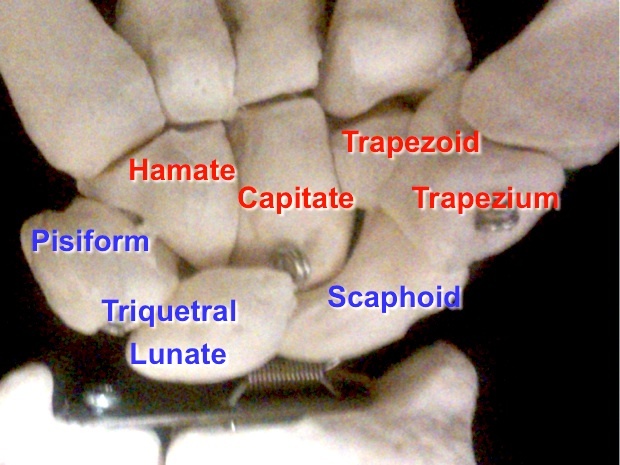 The MN is very superficial and is located just below the retinaculum, held between the hamulus of the hamate (uncinate process of the hamate) and the pistiform, and the tubercle of the scaphoid and the trapezium. 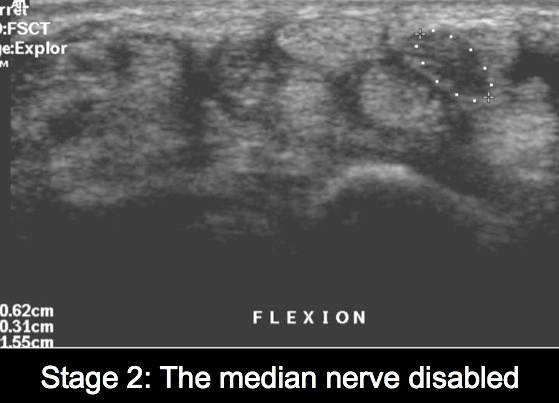 The Median Nerve rests on the tendons (t.) of the superficial flexors. The most superficial structure, after the skin and superficial fascia, is the t. of the Palmaris Longus. 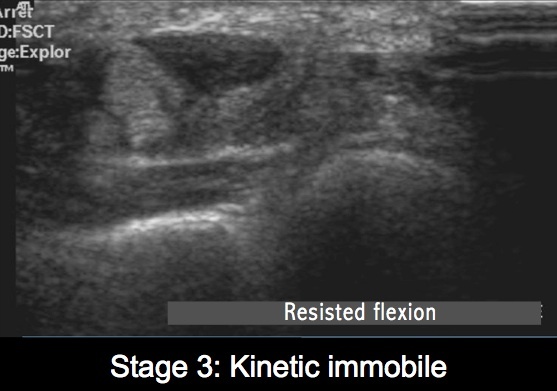 The MN is less echogenic than the tendons, and has a hypoechoic fibrillary pattern. The MN is located below the retinaculum, separated from the deep surface of the retinaculum by the echogenic nerve sheath. Towards the fingers, the MN narrows and divides into its branches, and innervate the interosseous muscles. 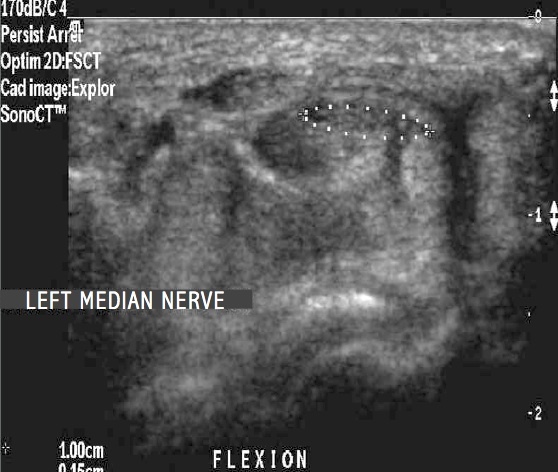 Below the retinaculum, the tendons retain their diameter and circular form while moving the probe towards the fingers, the Median Nerve flattens slightly in an elliptical shape. Wagner described the kinetics of the MN. Normally, with wrist flexion on a closed fist, the flexors pass above the MN, which is attached at a deeper level. Outside, in the CTS, the MN remains immobile during the kinetic test, likely as it adheres to the upper level. – Normal kinetics = stage 0: the MN glides easily between the tendons of the superficial flexors of the first and second fingers, or between the second and third fingers, and can be found between the first and second row of flexors. There, it is protected from conflict with the carpal ligament. – Stage 1: the Median Nerve remains at the surface, until a strong contraction of the flexor tendons permits passage to a deeper level between the flexor tendons. – Stage 2: the passage is difficult or rough, with a clicking sensation that may be audible. – Adherence to the retinaculum by inflammation: tenosynovitis, articular synovitis. If the MN is immobile under wrist flexion, or when the fist is closed, it is no longer protected, as it cannot rest safely in the free area. Medical pre-requisites to manual treatment night braces, cortisone injection. NB: SURGERY (section of the retinaculum) = only with myopathy. Preparation by mobilization and opening up of the joint disfunction of the wrist and hand, emphasizing the second and third columns. Manual adhesiolysis releases adhesions between the Median Nerve, retinaculum, and tendons until a restoration of normal kinetics of the released MN. Improvement of symptoms (≃90%) will be visible from the following day. Remission only lasts six months for advanced cases, thus requiring biannual treatments. 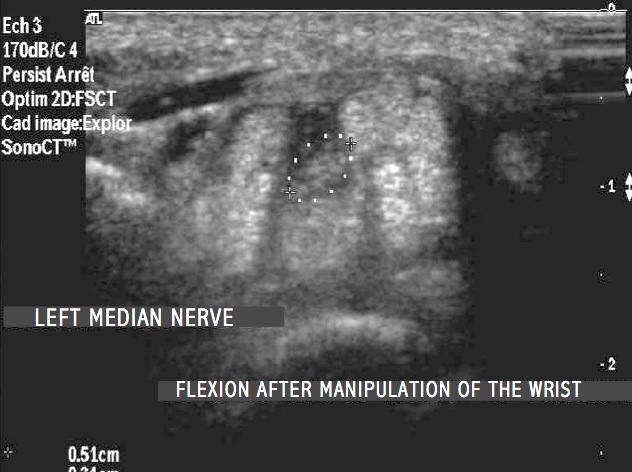 After Adhesiolysis the Median Nerve goes back between the Flexors during flexing of the wrist.